The passage of California Proposition 1A (2008) set in motion a complete reconstruction of the railroad between San Jose and San Francisco. This blog exists to discuss compatibility between HSR and Caltrain, integration issues, and the impact on adjoining communities. There's been no shortage of developments in recent months on the peninsula rail corridor. The Caltrain/HSR Blended Service Plan/Operations Considerations Analysis was published on the Caltrain website. This document aims to flesh out the 2012 Caltrain/HSR Blended Operations Analysis with more detail requested by stakeholders. While the comment period for this document is now closed, it has a number of weaknesses that should be addressed. Strange assumptions about service to San Francisco's Transbay Transit Center. For some obscure reason (agency turf?) all of Caltrain's simulations (see string charts in appendix, starting at page 29) send just two out of six trains per hour into Transbay, where essentially all the ridership will be. 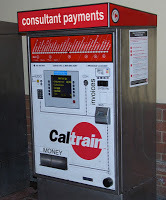 Most Caltrain traffic is assumed to terminate outside the financial district, at 4th and King. The string charts do not show any conflicts that would prevent sending at least four (if not all six) trains per hour to Transbay, making full use of the triple tracks in the downtown extension tunnels. If you accept that Caltrain isn't trying to spite its customers or diminish its own fare revenue, it's hard to imagine why any train would still terminate at 4th and King when it doesn't absolutely have to. Strange assumptions about Caltrain station dwell times. While the station dwell times of today's Caltrain service have been studied in excruciating detail, the way the dwell time statistics were incorporated into the simulation model may leave something to be desired. Dwell times are the only randomized input to the model, and the specific random distribution used to calculate them can have enormous impact on the results. Because of Caltrain's 8-inch platforms and inefficient passenger flows, dwell times can occasionally exceed two minutes, for example if a wheelchair user needs to board a train. The resulting dwell time random distribution has a long tail that reflects the "Russian Roulette" nature of today's operations. These occasional outliers can easily ruin a tight timetable by setting off a domino effect of delays to other trains, resulting in poor on-time performance. This is especially important because on-time performance (measured in minutes of delay), the figure of merit used to evaluate different operating scenarios, becomes sensitively dependent on the choice of dwell time random distribution. Consider level boarding, an improvement that Caltrain hasn't yet discovered how badly it needs. The lack of steps and abundance of doors makes dwell times shorter and, more importantly, far more predictable. The dwell time random distribution for level boarding does not have the long tail used in Caltrain's simulations, and we can finally stop playing Russian Roulette. Look no further than BART to get representative dwell time data. What is the effect of the long tail in the dwell time random distribution? Would level boarding be a better investment than building more passing tracks? We'll never know, unless the model is re-run with a different dwell distribution that simulates level boarding. Strange assumptions about the "hold out" rule. This operational rule mandates that when a train stops at an old, narrow center-boarding platform, no other train may enter the station until the first train has departed (otherwise bad things can happen). The practical effect of this rule is that trains operating on separate tracks can delay each other. The hold-out rule is slowly turning into an exception as stations are modernized, and today applies at only three stations: South San Francisco, Broadway in Burlingame, and Atherton. In a cute computational flourish, the hold-out rule was accounted for in all operational simulations in the Caltrain report, but nobody bothered to ask if it would make any sense to invest billions (with a 'B') in the peninsula corridor to build HSR passing tracks, all the while not spending a few million (with an 'M') to rebuild the three remaining platforms to retire the hold-out rule forever. Worse, Caltrain's analysis made no attempt to tease out the effect of the hold-out rule on minutes of delay, to quantify its effect relative to other sources of delay. This shortcoming could easily be remedied by re-running the model with and without the hold-out rule. It is important to note that the feasibility of operating Dumbarton Rail Corridor service on the Caltrain corridor in addition to the Caltrain and HSR blended system does not equate to having the capacity to add another Caltrain or HSR train during the peak hour. DRC service fits because it uses only portions of the corridor and does not require an end-to-end corridor operating slot. This is the exact same reason why all HSR service should enter the corridor at Redwood City from Altamont Pass, rather than gumming up the entire length of the peninsula corridor. The blended system would be easier to plan, cheaper to build, and provide far better service to passengers. Additional analysis is necessary. However, before doing so, speculation should be minimized. A better understanding of the schedule and decision on passing tracks should be advanced before further traffic analysis is conducted. That's a fancy way of saying that grade crossing conditions will depend heavily on what the eventual timetable will be, so that a timetable needs to be developed first. 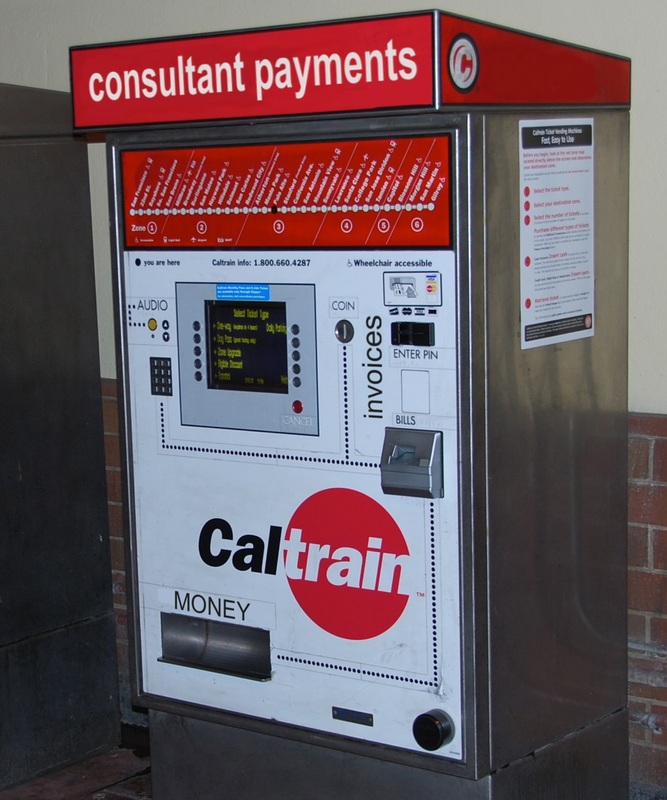 Perhaps Caltrain will some day see that everything revolves around timetable planning. The timetable is where it starts from, to determine infrastructure needs and grade crossing impacts, and also where it all ends up, to quantify service quality improvements for each community along the peninsula corridor. Timetable planning is precisely where Caltrain is not spending a lot of effort, because they think they already know the answer, in the form of a general class of "peak period skip stop zone express" timetables described in the 2012 Caltrain/HSR Blended Operations Analysis (see page 34). There's a lot of work left to be done in this area, starting with undoing Caltrain's mistaken fixation on "peak period skip stop zone express" timetables. As far as this grade crossing traffic analysis is concerned, Caltrain put the cart before the horse. Design work is about 50 percent complete, said Karen Antion, who is essentially the boss of CBOSS and a highly-experienced and highly-paid consultant. [...] The design of CBOSS should be complete by September, Antion said. Is this the same design work that leads up to the Critical Design Reviews that were supposed to have been completed last March? If so, CBOSS is now a year behind the original plan, and that's before the really hard task of integrating and testing a system that is so proudly proclaimed to be "unique to Caltrain." It sure is comforting to hear that we've got such a wide spectrum of on-call consultants to get us out of any trouble. Meanwhile, staff has already softened up the board for the impending Option 2 (Phase 3) contract, to be rubber-stamped at the August board meeting. The status of key milestones in the scope of Option 1 (Phase 2) is artfully avoided. This $86.5 million contract is the "final" increment of funding for CBOSS, before the need for an Option 3 (Phase 4) makes itself known, most likely in late 2014. Remember SuperVia, of Rio de Janeiro? They are already well into testing. Their consultants must be absolutely stellar. This is a strange claim to make, given that all the analysis reports commissioned by Caltrain in the last couple of years point towards additional passing tracks (the "midline overtake") being built right through San Carlos and the new Transit Village. The San Bruno grade separation opened to train traffic, even if the project is far from complete. Trains now use the tracks built atop a mechanically stabilized earth embankment (basically walls held together by the weight of the dirt fill in between) that could be representative of future grade separations elsewhere on the corridor. Read all about why, who, what, etc.